In Decemeber 2016, we sat down with Zoe to ask a few questions about her experience with Hatch Prime and Alpha. Zoe started at Hatch in Grade 7 and was in Grade 9 when we spoke with her. She has a keen interest in maths and sciences and had a lot of fun learning how to code with us. Why were you interested in computer programming? I was interested in computer programming because it is interesting to see how websites work, and how we can make things work. Were you excited about going to Hatch Canada? Yes, I was excited because it was a great opportunity. What programming skills did you learn when you first started at Hatch Canada? What are you working with now? What type of games or programs do you like to build? I like to build functional programs that do things, or have a purpose. What's the difference between Hatch Canada and Hatch Alpha? Do you think computer programming is an art or a science? I think it's both. It's logical and follows certain rules, but you can also do whatever you like with it, and it has a certain freedom to it. 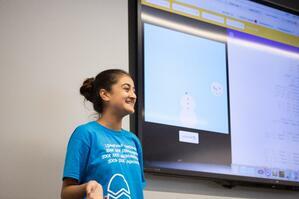 What do you think kids and teenagers need to know about coding that they might not already know? That they should learn it. Coding is the building blocks of everything we have today - our phones, our computers. It's how the internet works, how the apps on our phones work, and it's very important to know how these things function. Do you think you'll use computer languages in your career? I don't know. I might, I might not. I haven't decided yet. Is coding right for your child? Email us at support@hatchcoding.com to find out more.